Most chapters in The Radiologist's Guide to Meaningful Use and The Radiologist's Essentials to Meaningful Use: Essentials for Your First 2 Years have corresponding online content designed to assist you in the planning, analysis, and compliance phase of your meaningful use strategy. This supplemental material is referenced throughout the books and can be viewed and downloaded from this website. 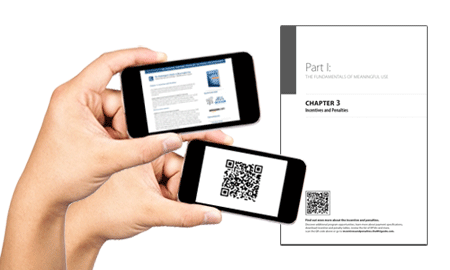 To enhance your experience we have incorporated QR codes and direct URLs throughout the text of the guide. These codes will direct you to specific areas of this online companion website where the most up-to-date information can be found. In order to use the QR codes, you will need a smartphone with a camera and QR code software. There are a number of free QR readers available, including Red Laser, QuickMark, and ScanLife, for multiple mobile device platforms. Direct URLs are also provided throughout the guide. If you have purchased the guide, but are having difficulty accessing specific content, please email us at info@theMUguide.com. 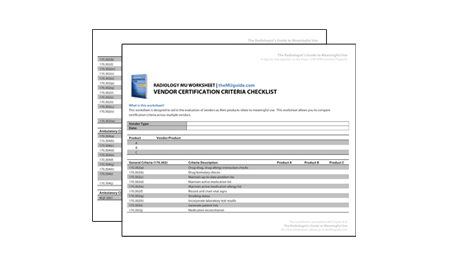 Many chapters in the guide point to worksheets that are designed to assist you in the planning, analysis, and compliance phase of your meaningful use strategy. These worksheets can be downloaded for free from this website using the corresponding QR codes and direct URLs throughout the guide.